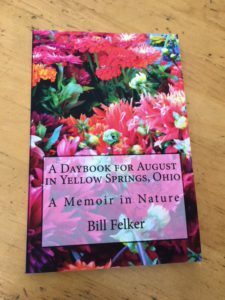 Felker’s selections about his sense of place explore his relationship with the local seasons, with his house, with his town and its surrounding parkland. “My home in Yellow Springs is a private observatory,” he says in “Homely Gnomons.” And tracking and marking the movement of the Sun on the walls of his rooms, he makes a map of his personal history, “with souvenirs following the shadows.” In “Merak and Dubhe,”he describes how he uses the flora of his neighborhood to track the progress of the year in other locations. “The Pond” is a meditation on aging and dreams of youth. In the pond near his house, Felker says, “the horizon was not the globe’s round, aloof, ever receding promise. This world was flat. This horizon was accessible, touchable. My reach for once did not exceed its grasp. I gave in to the attainable sea, its borders as fixed and finite as my own.” The final essay of the collection explains how his home is the point from which his entire life is measured. Home, like a spiritual Greenwich point, is the Prime Meridian. Throughout this collection, Felker explores place in nature within a context of observation and spiritual reflection. In HOME IS THE PRIME MERIDIAN, the sky, the land, plants and animals are touchstones for identity and meaning. Or Visit the Book Shop to order an autographed copy. 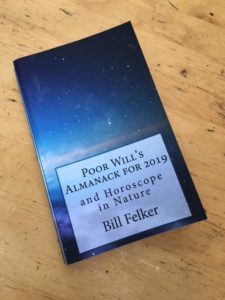 “When I go too far out, I need to gather my landmarks of home around me,” writes radio broadcaster and veteran almanac author Felker (Poor Will’s Almanac for 2018, 2017, etc.) in his short, aphoristic new work of reflections on nature. “Distant locations only make sense against my local gauge.” The more he understands where he is, he tells his readers, the more he understands himself. Consequently, he lavishes extraordinary care and attention on his small plot of field and woodland in Yellow Springs in southwestern Ohio, often characterizing the locus of home as the “prime meridian” in even the most far-ranging voyages. In the long tradition of nature diaries, he anchors dozens of short pieces on explorations of the seasons of the year, the moods of the weather, and, most of all, the characters and behaviors of all the animals he spots, particularly birds. Several of the architects of this kind of writing, from Ralph Waldo Emerson to John Burroughs, are quoted or paraphrased with obvious affection, and Felker’s animal portraits are warmly enhanced by what he freely admits is a liberal amount of anthropomorphizing. His birds and woodland creatures are often as metaphorical as they are material. He’s a careful and meticulous observer who nevertheless seldom falls into the trap reserved for scrupulous spectators: being tedious. He’s saved from this because he commands a light-footed prose style and he keeps his vignettes very brief. 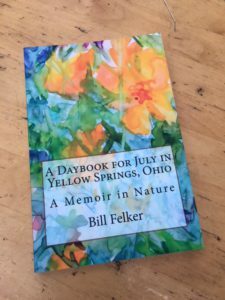 Felker has been crafting these almanac-style entries for many years, and his experience shows not only in the smoothness and economy of his storytelling, but also in the winning combination of humility and poetic insights he’s clearly mastered. He’s delightful company on the page, in everything from his subtle, sensory-heavy evocations of the seasons (winter being a specialty) to his accounts of the stars and his lush descriptions of the natural world’s various inhabitants, captured even in a quick list of the region’s bird life: “The sparrows, like starlings, staying tight to the motions of the flock; the acrobatic chickadees swooping in and out, remaining only seconds to grasp their sunflower seed and fly off; the wary, fluttering titmice; the blue jays, harsh and bullying; the hopping, syncopated nuthatches exploring upside down.” These passages are often layered with musings about the author’s moods—the immediate and sometimes-odd ways his feelings intersect with the flora and fauna he stumbles on (one of the book’s closing scenes, involving a group of pantry-raiding mice, is an especially touching example). The tone throughout remains highly personal, almost confessional, which often adds to the charm of the work. The author’s knowledge of the plants and animals in his realm is encyclopedic but never comes across as pedantic, and the resulting almanac is a tightly focused and wonderfully executed example of small-bore nature writing. Or, for an autographed copy, visit the Book Shop on this site. 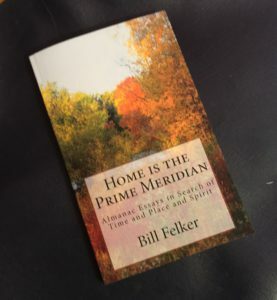 Home is the Prime Meridian: Almanac Essays in Search of Time and Place and Spirit by Bill Felker is a collection of non-fiction essays set in Yellow Springs, Ohio. The essays vary in length from one to four pages. As the title suggests, the essays focus on three topics: time, place and spirit. Told in sequence, these essays follow the seasons one experiences in a year: winter, spring, summer and fall. ‪Home is the Prime Meridian is a literary lover’s delicacy. The author utilizes masterful control over language to touch upon all five senses. 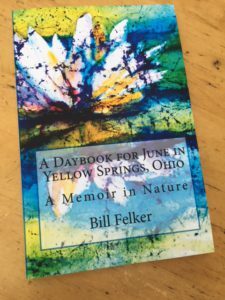 Felker further adds an emotional element to his writing to create a strong connection between the reader and the enchanting setting in which these essays take place. The tone throughout the collection is impassioned, sometimes nostalgic, and at other times, hopeful, but each essay is imbued with the same sincerity and reverence for nature. The writing is crisp, and the author’s word choices are eloquent, making one want to read, reread and reread again the short essays compiled in this collection. ‪The book is a collection of essays, but I think the author’s work would better be categorized as poetic, story-telling non-fiction. His way with words clearly sets the scene for the reader and transports one to the exact time and place being written about. 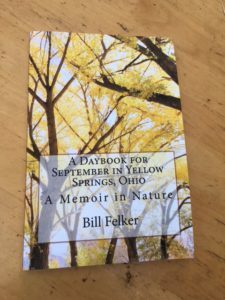 Although I have never been to Yellow Springs, Ohio, I could taste the harshness of the cold winter months; I could see the emerging color in the spring; I could hear the tranquil summer days, and I could feel the loss brought by autumn. Instead of feeling like an observer looking in on the author’s memories, I felt as if I was in a trance, imagining and remembering the very things described in each essay. ‪There are forty-two essays in this collection, and each one stood out as a unique and equally intriguing work of art. Many times, collections like this can feel repetitive or become tedious to read due to similar writing and use of the same literary devices over and over again. However, that is not the case with Home is the Prime Meridian. Each essay is thought provoking in its own way: some essays are lighthearted and easily decipherable, others are more obscure and require interpretation. However, I found each essay was as enjoyable as the next, and none failed to capture my attention. Further, whether we are reading about plants, animals, constellations or landscapes, each poem is somewhat introspective and all revolve around so much more than just the natural elements we think we are reading about. Loss, aging, spirituality, change, mortality, and the perpetual cycle of life are just some of the themes touched upon in Felker’s essays. ‪I devoured these essays one by one. Each time I thought I had found my favorite essay, another came along and impressed me even more. “Wow” was my reaction to the author’s words over and over again. The layers of meaning behind the short, sometimes simple words had me in awe of this writer’s ability to mold language and evoke emotions long buried in my mind. This is a collection I will cherish and return to frequently. I strongly urge lovers of nature, earth and the naturalistic to read this collection. I have never felt so strongly about a collection of essays; Home is the Prime Meridian is truly a treat for the senses and a writer’s delight. In my mind, this book deserves far more than four stars, but as that is the highest award I can give, I rate Home is the Prime Meridian a strong 4 out of 4 stars. A handbook for watching time in nature (horoscoping) with which readers may use the Sun, Moon, stars, planets, shooting stars, weather patterns, the farm and garden year, blooming plants and other living creatures to better understand and live with the external forces that shape their lives. The word horoscope comes from two Greek words, hora, which means hour or time, and skopos, which means observer. The time observer is a horoscoper, and for the horoscoper who watches the seasons, an “almanack horoscope” can offer a useful guide to the galaxy as well as to one’s own neighborhood. Indeed the land does reflect the sky above it, and the Earth watcher can create constellations and stories no less than the traditional astrologer. For the horoscoper, the landscape is rich with lessons and with possibilities for alignments and predictions. By focusing on events in nature, the time watcher not only observes how the weather and the movement of the Sun, Moon, stars and planets are connected to the seasons but also how events on Earth reflect what happens in the sky and how all of these events can be related to human emotions. 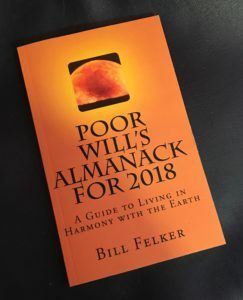 Listen to Bill’s latest interview with Vic Mckunas on the Book Nook, and access all Recent Poor Will’s Almanack Segments on NPR station, WYSO. Contains all my September notes between 1981 and 2017, including daily and weekly weather estimates, summaries of the progress of the season and a calendar of blooming plants, all applicable to the Lower Midwest, the Middle Atlantic region and the East. Contains all my August notes between 1981 and 2018, including daily and weekly weather estimates, summaries of the progress of the season and a calendar of blooming plants, all applicable to the Lower Midwest, the Middle Atlantic region and the East. Contains all my July notes between 1981 and 2018, including daily and weekly weather estimates, summaries of the progress of the season and a calendar of blooming plants, all applicable to the Lower Midwest, the Middle Atlantic region and the East. Contains all my June notes between 1981 and 2018, including daily and weekly weather estimates, summaries of the progress of the season and a calendar of blooming plants, all applicable to the Lower Midwest, the Middle Atlantic region and the East. 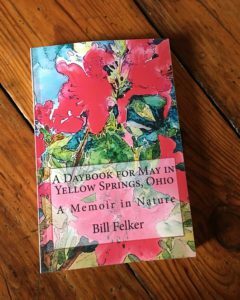 Contains all my May notes between 1981 and 2017, including daily and weekly weather estimates, summaries of the progress of the season and a calendar of blooming plants, all applicable to the Lower Midwest, the Middle Atlantic region and the East. Contains all my April notes between 1981 and 2017, including daily and weekly weather estimates, summaries of the progress of the season and a calendar of blooming plants, all applicable to the Lower Midwest, the Middle Atlantic region and the East. 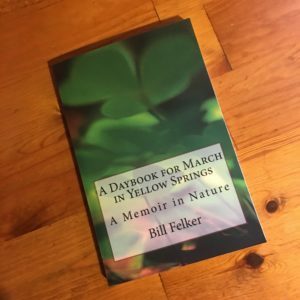 Contains all my March notes between 1981 and 2017, including daily and weekly weather estimates, summaries of the progress of the season and a calendar of blooming plants, all applicable to the Lower Midwest, the Middle Atlantic region and the East. NEW NAMES FOR THE MOONS: This year’s moons include the Frolicking Fox Moon, the Ducks-Scouting-for Nests Moon, the Termite Swarming Moon and many more. Each annual version of POOR WILL contains different Moon names that are based on an event that takes place in nature during that monthly period. THE S.A.D. STRESS INDEX measures the natural phenomena which are assumed to be related to Seasonal Affective Disorder: the day’s length, the average percentage of sunlight, the weather and the phase of the moon. In order to create the Index, each of those factors was given a value from zero to 25, and then the four values were combined onto a scale of one to 100. The higher the number, the greater the stress. Lunar phase and the Moon’s proximity to Earth produce the most dramatic swings in the Index. Lunar ratings are based on tidal and sociological information that suggests the Moon is most influential when it is full, second-most influential when it is new and least influential at entry to its second and fourth phases. METEOROLOGICAL FORECASTS: The weather estimates in this Almanack are based on Bill Felker’s charts of fractal weather patterns made between 1978 and 2017. Readers of his weekly and monthly columns throughout the United States have used these estimates successfully since 1984. Poor Will’s Almanack for 2018 integrates lunar conditions with brief descriptions of expected weather systems in its “Almanack Daybook” section, suggesting how the moon’s phase and proximity to Earth could influence the character of each major shift in barometric pressure. A CALENDAR OF FEAST DAYS for homesteaders, gardeners and farmers lists the days of the year one might expect the public to have increased interest in livestock or produce. This calendar is also useful when one is planning strategies for marketing to particular ethnic or religious groups. THE PEAK ACTIVITY TIME FOR CREATURES section is a monthly guide to lunar position and corresponding behavior. Many people find that livestock, children, fish and game are more active (and dieting is more difficult) when the moon is overhead: at midday when the moon is new, in the afternoon and evening when the moon is in its first quarter, at night when the moon is full and in its third quarter, in the morning when the moon is in its fourth quarter. Second-best lunar times occur when the moon is below your location, 12 hours before or after those times noted above. The approach of weather systems (high-pressure systems typically preceded by low-pressure systems) also influences fish and animal activity. THE ALMANACK DAYBOOK SECTION consists of daily gardening and farming notes, phenological information about changes in foliage, flowering and migratory activity throughout the year as well as commentary about lunar influence on predicted weather systems and seasonal stress. 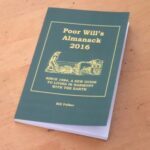 READER STORIES: Readers have been contributing to POOR WILL’S ALMANACK’S weekly and monthly columns since 1985. People have submitted memory stories, outhouse tales, narratives about unusual occurrences and special animals. Each annual version of the ALMANACK features the best submissions from recent years, and the 2018 edition includes several fine outhouse tales, such as “A Terrible Outhouse Afternoon” by Willy O’Halleran and “Surprise in the Outhouse” by Aldon Cisco. Or Visit the Book Shop to order from this site. You can hear Bill’s weekly radio segment on NPR station WYSO every Tuesday morning at 6:35 and 8:35 (EDT). You can listen to podcasts and read the almanack essays following the link on this site. Explore Bill’s Phenology Journal for descriptions of the many seasons of the year. His Almanack Essays offer reflections on how his observations of natural phenomena have formed his personal philosophy. 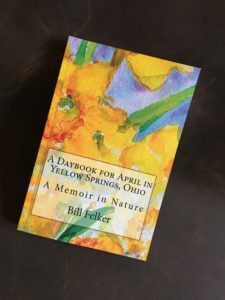 His Daybook offers a daily record of common events in nature in and around his home in Yellow Springs, Ohio.